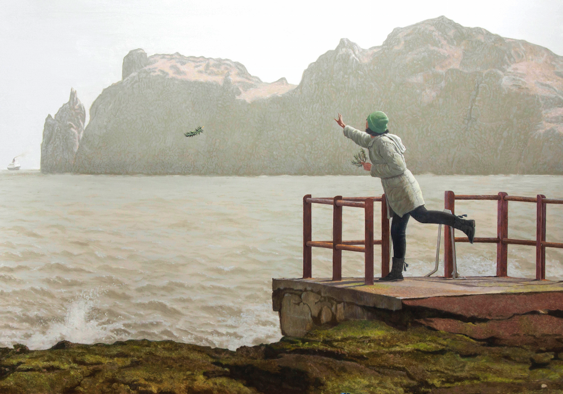 A woman throwing a sprig of rosemary into the sea in remembrance of her father, a ship’s engineer. Our neighbour had been on the last cruise of the QE2 on its passage around Cape Horn, where this 'rite of passage' moment actually happened. Cape Horn's seascape looks remarkably like Ireland's Eye, the island offshore from the woman's coastal house in County Dublin, which overlooks this bathers' point called High Rock. I merged the two experiences of the voyage and the coastal point, 'sailing' High Rock like the ship nearer to Ireland's Eye, with the ship in the distance of memory's mists. It's a true fiction.